The Mudumalai National Park or Wildlife Sanctuary resides on the northwestern side of the Nilgiri Hills (Blue Mountains), in Nilgiri District, about 150 km north-west of Coimbatore city in Kongu Nadu region of Tamil Nadu. By sharing its boundaries with the states of Karnataka and Kerala, the sanctuary is divided into 5 ranges – Masinagudi, Thepakadu, Mudumalai, Kargudi and Nellakota. The Mudumalai Sanctuary is an important wildlife habitat due to its strategic position as a Wildlife corridor between several other protected areas making an essential part of the Nilgiri Biosphere Reserve. Its north is being crusted with Bandipur National Park and Nagarhole National Park and at its west is the Wayanad Wildlife Sanctuary along the south corner is flourished with Mukurthi National Park and Silent Valley National Park. These parks, sanctuaries and the adjoining Reserve forests cover over 3,300 sq kms of forest supporting a population of 1800–2300 elephants. The area is also being termed as Madumalai Tiger Reserve due to the presence of around 48 tigers in the Nilgiri Reserve across which tigers are free to roam. In April 2007, the Tamil Nadu state government declared Mudumalai as a Tiger Reserve, under the section 38V of the Wildlife Protection Act of 1972, in an effort to conserve the country's dwindling Tiger populations. Afterward, about 350 families living in the core area have been evicted from the park bringing 1 million rupee ($20,800) as compensation. Those residing in the 5 km of buffer area around the park were in fear that they too will be evicted but as a matter of pleasure nobody were dislodged from the buffer zone. In fact, some people in this zone were kept involved in the project as trackers and guides to enhance their income through ecotourism. This protected area is an ideal home to several endangered and vulnerable species nestling Indian elephant, Bengal Tiger, Gaur and Indian Leopard. There is a high diversity of animal life in the sanctuary with about 50 species of fishes, 21 species of amphibians, 34 species of reptiles, 227 species of birds and 55 species of mammals. Mammal diversity is higher in the dry deciduous and dry thorn forests than in the other habitats. 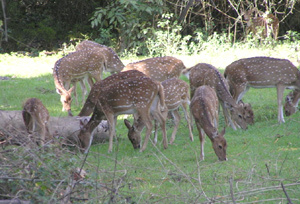 Thirteen percent of all mammal species in India are present in Mudumalai wildlife sanctuary. There are at least 266 species of birds in the sanctuary, including critically endangered Indian White-rumped Vulture and long-billed vulture. Around 8 % of the bird species in India can be found in Mudumalai Wildlife Sanctuary. Among the counts of 227 bird species in the area, 110 species are insectivores, 62 are carnivores, 23 species are fishivores, 12 species are omnivores and 20 species are grainivores. Madumalai Reserve is accosted with three major types of forest in the sanctuary: tropical moist deciduous to be found in the western Benne Block, where rainfall is higher than in the other blocks; tropical dry deciduous forest in its middle and southern tropical dry thorn forests in the east. Additionally, there are patches of tropical semi ever green forest in the Southwest and Western part of Mudumalai. The annual rainfall there exceeds 2,000 mm (79 in). Tree species in this habitat include Litsea mysorensis, Casseria ovoides, Cinnamomum malabatrum and Olea dioca. Climbers including Sneeze Wort (Watakaka volubilis), Gnetum ula and Entada scandens are also found in these semi evergreen forests. Moist Bamboo brakes can be found among dry deciduous, moist deciduous and semi-evergreen forests and along the fringes of riparian forests and swamps. There are two species of bamboo found in Mudumalai, the giant clumping bamboos: Bambusa (arundinacea) and Dendrocalamus strictus. In such types of forest, a green strip of riparian forest can also be seen along the shore of dry seasonal and perennial streams. This type of forest remains green throughout the seasons. The plant species found here includes: Mangifera indica, Terminalia arjuna, Pongamia glabra, Indian rosewood Dalbergia latifoli, Syzygium cumini and the bamboo. Moyar River - running through the dense forest this river is an ideal place to cite animals when they come to drink water along its bank. Moyar River Gorge - also called the Moyar Canyon, is a dramatic 20 km long gorge dug out by Moyar River that plunges into the gorge below Theppakadu in a roaring water-fall. This fall is popularly known as the Moyar falls. Elephant Feeding Camp - this is the place where one can interact with elephants and see how they are fed. The captive elephants in the sanctuary are no longer used for timber extraction work, since these areas are managed exclusively as protected areas. The elephants are engaged mainly for Eco-tourism, patrolling for anti poaching operations, to control Man-Elephant conflict outside the sanctuary or other areas and as a conservation and training centre for elephants which can be visited by the public. Madumalai Museum - lying near the Elephant feeding camp, this museum is the perfect location where some animals (who once lived in the Mudumalai Jungle) are preserved. Kallatty falls - located 30 km from Theppakadu, is a beautiful falls with a magnificent view for leisure treatments. Pykara Lake - Located 40 km (25 mi) from Theppakadu is a clean and scenic lake aligned between the hills. It is an inaccessible lake, free from pollution and crowds where the tourists can enjoy boating. An annual summer boat race was introduced to this lake in 2008. Besides these attractions, many scenic spots in the sanctuary are available like the Chief Minister's Watchtower, the view point at Kargudi and the Ombetta Lake. There are multiple safari van rides on Sand Road, Circular Road, Manradiar Road, Jayadev Avenue and Bombax Road for more adventurous fun. The public roads like Kakkanalli – Torapalli road, Teppakkadu – Masanagudi road and Moyar – Masanagudi road are also worthwhile places to catch wild life in the Sanctuary. 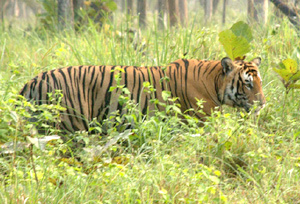 Bandipur National Park : Bandipur National Park is known for its majority of tiger species in its ranges. The park also shelters some of the most rare and endangered species of wildlife. Bandipur National Park is one of the protected areas within Nilgiri Biosphere Reserve, which is an International Biosphere Reserve in the Western Ghats. Wayanad Sanctuary : The second largest wildlife sanctuary in Kerala is the Wyanad Sanctuary. It is bestowed with lush green forests and rich wildlife. It exhibits some of the rare and endangered species of both flora and fauna. The sanctuary comes under Protect Elephant and one can spot herd of elephants roaming in the area. Masinagudi : Masinagudi is best known for night safaris in open top jeeps arranged by the resorts management authority and expert guides for freely accessible in Masinagudi. The night safaris are conducted on the peripheral roads running through the adjoining forest and not into the park as freaking out in the buffer area at night could be dangerous and may create disturbance to the animals of this region. For safari excursion in Madumalai, the Elephant Safari and Van Safari are conducted by the Tamil Nadu Forest Department. The tourists need to depart from the park headquarters at Theppakadu. Safari Timing – 06:00 AM to 08:00 AM and 04:00 PM to 6:00 PM. The nearest city to the sanctuary is Gudalur. Mudumalai is accessible via the NH – 67 which is 100 km from Mysore, 39 kms from Ooty and 3 kms from Gudalur. The Nearest railway station to reach Madumalai is Udagamadalam station in the Nilgiri Mountain Railway service, which is nearly 64 km away. Taxi services are available from Udagamandalam to Mudumalai to directly reach at the sanctuary. Major broad gauge railway station nearby is Coimbatore junction. This station is well-connected to all the major cities in the country. The Bangalore Airport is the nearest airport at the distance of 35.5 kms. 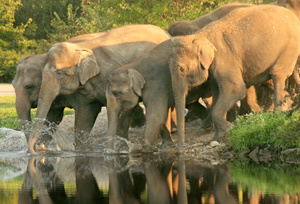 Mudumalai is one the most sought after wildlife tourism hotspots of Tamil Nadu. Rooms in Mudumalai hotels are generally fully reserved between June to September and October to December, as the season is most conducive for wildlife spotting. This wildlife national park is the major tourist attraction of Mudumalai and most of the hotels are located in close proximity to the park. Mudumalai is usually crowded during the peak season and rooms are booked in advance by tourists just to be on the safer side. Besides, multiple luxury suites and hotels are available in the vicinity for the most sophisticated stay during the jungle tour for greater advantages.